The Conservation Department works with all departments at the Gallery to ensure the long-term care of the collection. The department recognizes the importance of preventive conservation and recommends, develops, and institutes measures to ensure appropriate conditions for the storage, transport, and display of art. Working in collaboration with curatorial staff, the department undertakes appropriate conservation procedures on individual objects to the highest-possible standards in accordance with the Code of Ethics and Guidelines for Practice of the American Institute for Conservation of Historic and Artistic Works. Conservators examine and analyze objects in the collection to inform treatment methods and further teaching, scholarship, and research. Conservation treatments avoid compromising future research potential of objects. Conservators investigate materials and techniques using microscopy, X-radiography, X-ray fluorescence, and infrared reflectography. More advanced methods of analysis are coordinated with the Institute for the Preservation of Cultural Heritage at Yale University’s West Campus Collections Center and other laboratories. Examination and treatment documentation is thorough and stored in formats that ensure long-term preservation. The department partakes fully in the Gallery’s mission to teach and disseminate knowledge. Courses in conservation, connoisseurship, and technical art history are taught using the Gallery’s collection and facilities. Conservators have now completed the restoration of a painting in the Gallery’s collection recently reattributed to Diego Velázquez. Donated to the museum in 1925, The Education of the Virgin was long considered to be a work by an unknown Spanish artist until technical examination and analysis of the materials used in the painting supported a reattribution to Velázquez—possibly his earliest major commission. The painting has undergone a close technical and analytical examination and an exhaustive conservation and restoration project led by Carmen Albendea, Associate Conservator of Paintings, and Ian McClure, the Susan Morse Hilles Chief Conservator; Anikó Bezur, the Wallace S. Wilson Director of Scientific Research at the Yale Institute for Preservation of Cultural Heritage; and Jens Stenger, Associate Conservation Scientist at the Yale Institute for the Preservation of Cultural Heritage. The scientific findings of the project have been published in the Gallery’s recently released publication The Young Velázquez: “The Education of the Virgin” Restored. Upon completion of the restoration, the painting traveled to Seville, the birthplace of the artist, where it was the centerpiece of the exhibition El joven Velázquez: “La educación de la Virgen” de Yale restaurada. It was also included in a major exhibition devoted to the artist at the Galeries Nationales du Grand Palais, Paris, which was on view through July 13, 2015. Another important project recently undertaken is Shiyanthi Thavapalan’s investigation of the Gallery’s Assyrian wall reliefs, acquired in 1854, soon after they were excavated from a palace built by the Assyrian king Assurnasirpal II between 883 and 859 B.C. at Kalhu, in present-day Nimrud, Iraq. Thavapalan, a Ph.D. candidate in Near Eastern Languages and Civilizations at Yale, knew that these works were once painted; despite several previous cleaning and reconstruction campaigns, red and black pigments are still visible on the reliefs nearly 3,000 years after they were applied, especially on the feet of the winged genie and human attendant. But Thavapalan wanted to know what other pigments were part of the original works and can no longer be seen. For her doctoral research on the use of color in ancient Mesopotamia, she has been working closely with Carol Snow, Deputy Chief Conservator and the Alan J. Dworsky Senior Conservator of Objects; Susan Matheson, the Molly and Walter Bareiss Curator of Ancient Art; Lisa Brody, Associate Curator of Ancient Art; and Jens Stenger, Associate Conservation Scientist at the Yale Institute for Preservation of Cultural Heritage. Their focus has been on “Egyptian blue,” a pigment made by grinding a blue faience-like material containing copper as a colorant. Using a relatively new technique to detect Egyptian blue, called visible-induced luminescence (VIL) imaging, Snow, Stenger, and Thavapalan tested the reliefs and found traces of Egyptian blue in many areas of the two large reliefs. Thavapalan will incorporate the results of this collaborative project into her dissertation. Though it is difficult to imagine that the now somber-toned alabaster once had complex polychromed surfaces, our view of the ancient world is being altered by this exciting new research. For more information and images from this research project, click here. Ian McClure, the Susan Morse Hilles Chief Conservator, is a graduate of Bristol University and Edinburgh University. While a curator in the Fine Art Department at Glasgow Art Gallery and Museum, he trained as a paintings conservator and was appointed Head of Paintings Conservation in 1978. He became Director of the Fitzwilliam Museum’s Hamilton Kerr Institute at the University of Cambridge in 1983 and Assistant Director for Conservation at the Fitzwilliam Museum in 2004. Appointed Chief Conservator at the Yale University Art Gallery and Yale Center for British Art in July 2008, he has been working under the direction of Yale’s Deputy Provost for the Arts and with the Head of Preservation at the Yale University Library to plan and develop a new conservation facility at the University’s West Campus, and for which he was named Director for the Center for Conservation and Preservation in 2012. He teaches the Technical Examination of Art course in the Department of the History of Art and the Kress Summer Teachers Institute in Technical Art History, both at Yale. Carol Snow, Deputy Chief Conservator and the Alan J. Dworsky Senior Conservator of Objects, is a graduate of Skidmore College and the Winterthur/University of Delaware Program in Art Conservation. Prior to joining the Gallery’s Conservation Department in September 2008, she worked at the Walters Art Museum, in Baltimore, and then as a conservator in private practice, primarily for museums in the greater Boston area. As an objects conservator, she has treated a wide range of materials, from ancient bronzes to modern plastics. Carol has also worked on archaeological projects around the Mediterranean and received a Fulbright Scholarship to work in Turkey. Her research interests include collaborating to develop new approaches to challenging conservation projects; technical analysis of materials, fabrication methods, and previous restorations; and replication of works of art using traditional and new technologies. Carol lectures for the Technical Examination of Art course in the Department of the History of Art and the Kress Summer Teachers Institute in Technical Art History, both at Yale. Theresa Fairbanks Harris, Senior Conservator of Works on Paper, has worked for museums at Yale University since 1982. She earned a B.A. in Art History and Studio Art from Yale and, as an undergraduate, worked in the conservation laboratory for the Beinecke Rare Book and Manuscript Library. She earned an M.S. in Art Conservation with a major in Paper Conservation and minor in Photograph Conservation from the Winterthur/University of Delaware Program in Art Conservation, with an Advanced Certificate in Conservation from the Fogg Art Museum, Harvard University, in Paper Conservation. She has worked at the Metropolitan Museum of Art and the Smithsonian Conservation Analytical Laboratory. As Paper Conservator at the National Museum of American History, she designed the museum’s Paper Conservation Laboratory. She lectures frequently and has taught courses at, among others, the Yale School of Art, the Department of the History of Art and Department of Music at Yale, and the Rare Book School. Irma Passeri, Senior Conservator of Paintings, received her training at the conservation school of the Opificio delle Pietre Dure, in Florence, Italy, where she received her degree in the Conservation of Easel Paintings in 1998. After working in the laboratory of the Opificio delle Pietre Dure, she was invited by the Gallery in 2001 to restore the large dossal depicting the Virgin and Child enthroned with saints Leonard and Peter by the Magdalen Master. Two years later, she was asked to restore the Portrait of Alessandro de Medici by Pontormo at the Philadelphia Art Museum. In 2004 she returned to the Gallery to join the conservation staff full-time. She has published articles on materials and techniques of Italian paintings and on Italian approaches to the restoration treatment of loss compensation. She lectures for the Technical Examination of Art course in the Department of the History of Art and the Kress Summer Teachers Institute in Technical Art History, both at Yale. Anne Turner Gunnison, Associate Conservator of Objects, graduated with a B.A. in art history from Stanford University and received a M.A. in Principles of Conservation and a M.S. in Conservation for Archaeology and Museums from the Institute of Archaeology, University College, London. She worked as a postgraduate fellow at the Smithsonian’s National Museum of the American Indian before joining the staff at the Yale University Art Gallery in 2010. Her current research interests cover a wide range of materials and cultures, from ancient Roman painted shields to contemporary time-based media. Anne is also interested in development of noninvasive conservation methodologies. She lectures for the course Technical Examination of Art for the Department of the History of Art and at the Kress Summer Teachers Institute in Technical Art History, both at Yale. 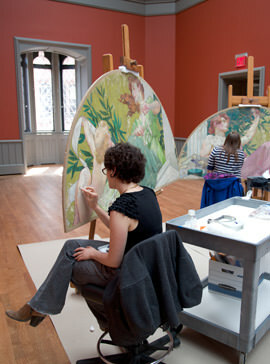 Cynthia Schwarz, Associate Conservator of Paintings, studied painting at the Rhode Island School of Design, in Providence, and painting conservation at the Winterthur/University of Delaware Program in Art Conservation. She has held internships at the Balboa Art Conservation Center, in Spain; the Château de Parentignat, in Auvergne, France; and with private conservators before joining the staff at the Gallery in 2008. Her current research interests include the conservation of 19th-century American murals, the structural treatment of canvas paintings, and how advances in microbiology can aid in materials identification in conservation. She lectures for the Technical Examination of Art course in the Department of the History of Art and the Kress Summer Teachers Institute in Technical Art History, both at Yale.